Today I wanted to share a super fun Christmas card with you. And it's all about My Favorite Things. Did you see their sketch this week? If you haven't make sure you visit their blog post! It's a fun one and since I just got my order from them I decided to play right away, as the sketch totally supported the stamps I wanted to use. So, this stamp set is all about Christmas, called Seasonal Sentiments and I love how playful the fonts are!!!! It's their current triple scoop set, so I made sure to order some other goodies just to be able to get this beauty!!! Of course that is never hard to do, as there are so many goodies to choose from. 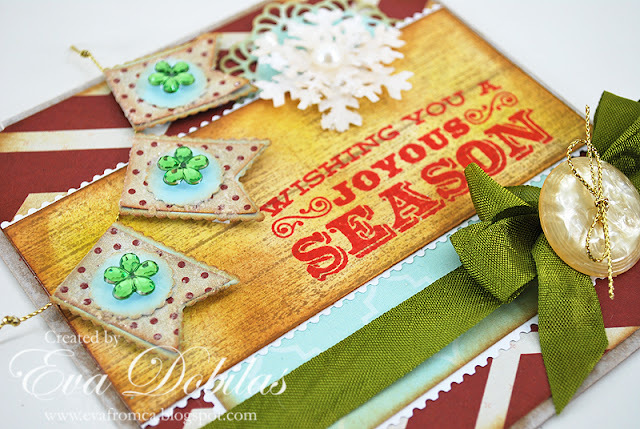 One of the stamps I got this month is LJD Western Backgrounds, and I am in love with that, too, in fact I used it on this card. The panel I stamped my sentiment on is using one of the backgrounds, which I than went over with some distress inks to warm up. I really like the way it turned out. My papers are by My Minds Eye....sure love this little pad. Since this sketch was all about banners, I pulled out my Die-namics Fishtail Banners to play with. 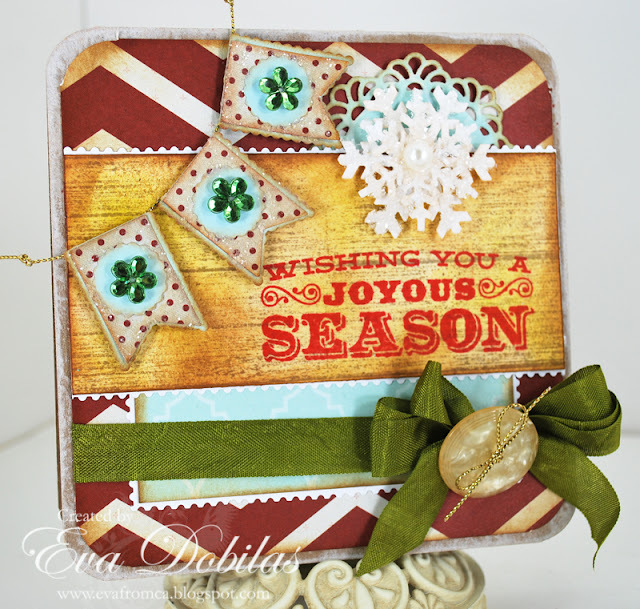 I also added Die-namics Let it Snowflake, which I used chunky glitter on, and Die-namics Decorative Doily Duo. The green little flower bling on my banner is by Making Memories. And of course I had to use some more seam binding ribbon. Well, hope you like this little card. Thanks for visiting! Enjoy your weekend!!! !